This complete kit makes it easy to start exploring the exciting art form of calligraphy because it comes with everything a beginning artist needs—from a set of high-quality materials to comprehensive instructions. 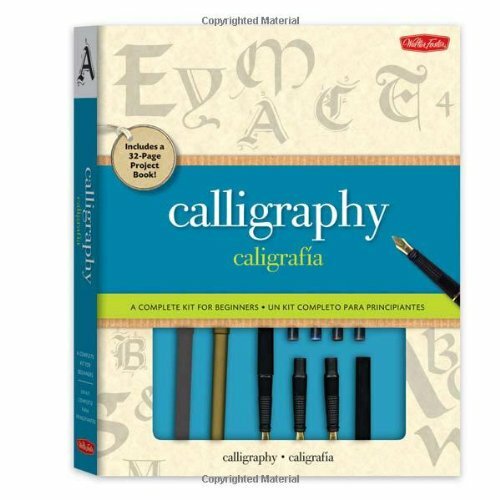 The lettering book covers the basics—such as pen styles, angles, and hand positions; letter heights and spacing; and practice strokes—before offering advanced techniques for rendering several calligraphic alphabets. And every lesson can be accomplished with the array of writing materials provided. The hardcover case includes a 40-page paperback book with corresponding Spanish instruction, a cartridge calligraphy pen, 3 pen nibs, 10 ink cartridges, 3 felt-tip calligraphy markers, calligraphy paper, a guideline sheet, and paper. Warning! This product is intended for use by ages 13 and older and is not intended for use by children. Packed with everything a beginning artist needs to explore the art of calligraphy. Kit includes a cartridge calligraphy pen, three nibs, ten ink cartridges, four felt-tip pens, calligraphy paper, a guideline sheet, an artist's triangle, a practice paper pad and a comprehensive and easy-to-follow 32-page instructional book.